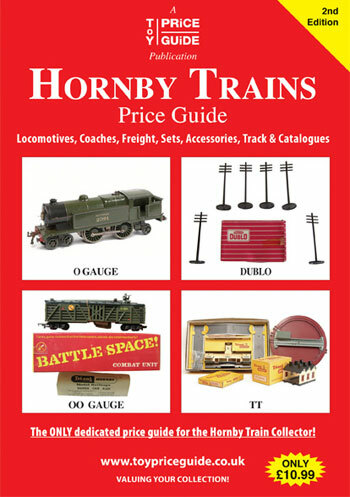 Our Brand New 100-page 2nd Edition is the only publication dedicated to providing values on vintage Hornby O & OO gauges, Dublo & TT ranges and includes the most comprehensive guide to accessories, sets and catalogue values produced by the company during their long history. All Locomotives are listed by individual running number & operator, and the guide lists all the products produced in the UK by Hornby/ Tri-ang before production moved to the Far East in the mid 1990s. 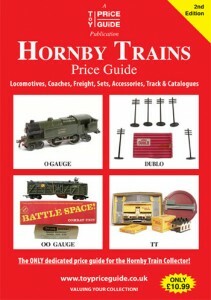 Packed with over 200 colour pictures, the publisher has been granted access to several of the country’s finest collections and lists several never before listed items together with overseas issues and uses the very latest prices achieved through UK auction houses and the internet making it a must for all those interested in vintage Hornby Trains. How To Order – our secure site accepts Pay Pal and all major credit/debit cards. Alternatively we are happy to receive cheques/PO’s payable to Toy Price Guide and sent to our UK office: Toy Price Guide (Hornby) c/o S.Epton 5 Manwaring Way, Swineshead, Boston, Lincs, PE20 3NU (UK) We also offer discounted rates for retailers & specialist traders requesting 5 or more copies. For more information please use the CONTACT US button on our home page and we will forward details.